One of the most interesting Pharaonic temples located near the Southern borders with the Sudan. The temples of Abu Simbel are one of the most interesting Pharonic temples located near the Southern borders with the Sudan. It is located 280 km to the South of Aswan and it consists of two rock-cut temples both date back to the reign of Ramsis II (1290-1223 BC). The first temple was built by king Ramsis II and dedicated to god Re-Hor-Akhty, Amon, Ptah, and king Ramsis II as a deified person. Its façade is 35 m. long and 30 m. high. The façade has four seated colossi of the king, each one is 20 M in height and represents the king seated on his throne wearing the double crown, while accompanied by 3 small figures of his wives, daughters and sons flanking his legs. Above the entrance stands the figure of Re-Hor-Akhty. Near the submit of the façade there are number of baboons. Inside the temple there is a hall supported by Osirid shaped pillars, cut in the the rock. The walls of this hall are decorated by battle and offering scenes. 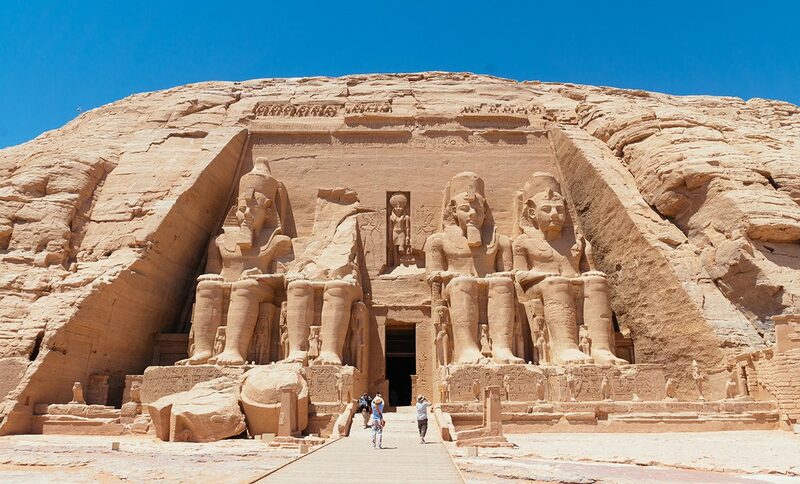 At the end of the temple is the sanctuary which contains four statues represent Re-hor-akhty, Amon-Re, Petah and the fourth represents the deified Ramses II. Also there are some side rooms decorated with various scenes. Inside the temple there is a hall supported by Osirid shaped pillars, cut in the the rock. The walls of this hall are decorated by battle and offering scenes. At the end of the temple is the sanctuary which contains four statues represent Re-hor-akhty, Amon-Re, Petah and the fourth represents the deified Ramses II. Also there are some sided rooms decorated with various scenes. Four of them represent Ramsis II and two represent the queen Nefertari and each is accompanied by two smaller figures of their children. scenes depicting the king and the queen making offerings to the different deities. At the end of the hall there is a doorway leading to a transverse Vestibule decorated with scene of the king Ramsis the II making offering to Re-Hor-Akhty while the queen presenting flowers to Khenum, Sat-tet and Anket. The Transverse Hall leads to the Sanctuary which contains a niche in the rear wall with a statue of goddess Hathor as a cow protecting Ramsis II.